The rights to a catalogue of British comic titles dating back more than 130 years has been bought up by the publishers of cult comic 2000 AD. Rebellion's acquisition of the archive of TI Media follows its purchase of the Fleetway archive in 2016. It means the Oxford company now has biggest catalogue of English language comic book properties in the world. The deal includes Billy Bunter, Sexton Blake, Valiant, Look-In, and the 19th Century title Comic Cuts. 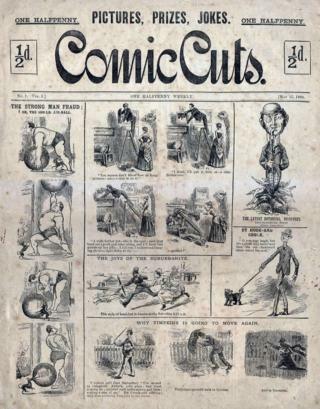 Rebellion claims Comic Cuts - which held the record for the most issues of a British weekly comic for 46 years until The Dandy overtook it - gave the comic book medium its name. In all it bought 400 separate weekly and monthly titles. Jason Kingsley, CEO of Rebellion, said: "Rebellion's reputation is not just as an innovative and forward thinking comic book publisher, but as the first company to respect and do justice to the extraordinary legacy of multiple generations of artists and writers who developed the comic book medium in this country. "It gives me great pleasure to secure the future for this extraordinary archive and I am incredibly excited to able to bring back into print so many lost treasures." The archive includes an adventure comic called Marvel, which ran from 1898 to 1922, but is unrelated to the American comic publisher. There are also works by Michael Moorcock, and Superman co-creator Jerry Siegel. Grim future - is Judge Dredd's satire still relevant? Rebellion recently rebooted football comic hero Roy of the Rovers, one of its acquisitions from Fleetway. Recent years have also seen it branch out into film and TV, with announcements of a Judge Dredd series, and a Rogue Trooper movie, the latter to be directed by Duncan Jones.